Do you have a child who would love to see a firetruck up close? What about a police car, army truck, John Deere tractor, digger, dump truck, or backhoe? Touch-a-Truck events give kids the opportunity to sit in the driver's seats, and even honk the horns of these unique vehicles! Wondering where to find a Touch-a-Truck near you? 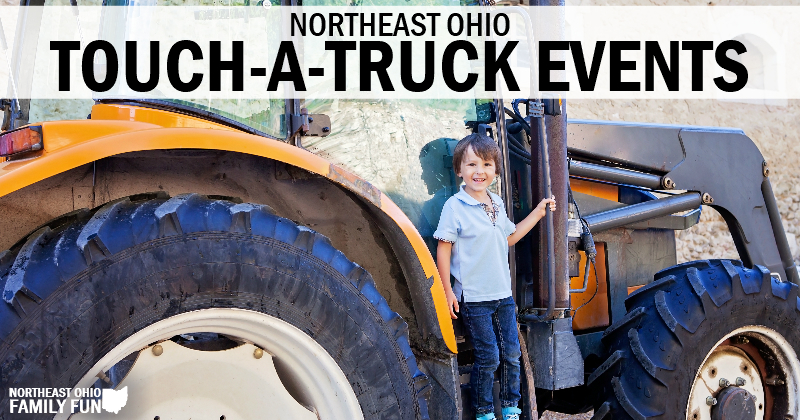 Check out our of list of local Touch-a-Truck events happening across Northeast Ohio! If you know of a Touch-a-Truck Event not listed, please submit the details here. Thanks! When: Saturday, April 20, 2019; 10am sharp! National Night Out and Truck & Tractor Night combined for one amazing event! Cost: FREE parking. Activities require the purchase of tickets, $1 each. Cost: Admission is FREE. Please bring a canned good (non-perishable item), which will be donated to the Parma Hunger Center or your loose change to be donated to the Parma Animal Shelter. These touch-a-truck events were held in previous years. Once information is available for this year we will update to include. Thanks! If you have an update on these of any other Touch-a-Truck Events in Ohio, submit the details and we’ll get it added to the list. Thanks! is there a facebook page to keep up with all of the events? The ones with dates are happening in 2016, but the ones at the bottom of the article without a date and listed as TBA have occurred in years past, but have no information for 2016 yet. When information is made available they will be updated. The listing for the Grindstone event is incorrectly showing an address for Cuyahoga Falls. The Grindstone event is in Berea; I do not know the address. Thank You for pointing out the typo. I’ll correct it now. Thanks for providing all the information. Quaker Steak & Lube in Medina Township will be hosting a Touch a Truck event which also benefits Big Brothers Big Sisters, a mentoring organization for at-risk youth in the community. The event is from 12-3pm on September 21st. Thanks for letting me know about the touch a truck. I’ve added it to the list and also included it in the Weekend Events Round-up. The Touch-A-Truck event at the Ashland Public Library will be held on Saturday, August 2, 2014 from 10:00 am to 1:00 pm. Do you know yet if there will be any touch a truck events in or near the Youngstown area? I just found out that there will be a Touch-a-Truck this weekend in Boardman and next weekend in Poland. I’m updating the listing right now. Thanks for checking! I would like to know if this event is going to be in Stark County? There is typically a touch-a-truck in both Massillon and Jackson Township. I will update the listing as soon as I find out if they are having one in 2013.